Into fancy tea party or coffee party for a long time? Or just want a leisure and peaceful afternoon tea with family? 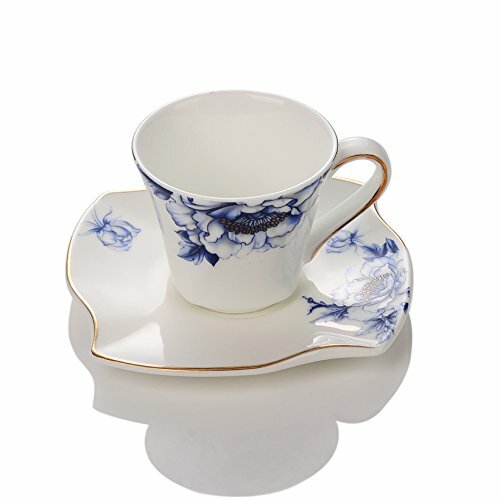 No hesitation about getting this porcelain blue floral cups and saucers set. The blue flower trimmed with gold on the coffee cups set enables it to create an elegant teatime table for you. Porlien, dedicated to producing and bringing porcelain with supreme quality to china lovers all over the world for years, is well-known for the toughness, thinness, heat preservation, and safety of its porcelain. All tableware we offer is not only tough and light, but approved by FDA and IOS. No matter you are looking for dinnerware for household use, restaurants, cafes or hotels, Porlien can satisfy your needs. We strive to create better life for our customers by providing safe and durable dinnerware for them. 30-day warranty: On condition that you receive defective or broken products, please contact us directly. Porlien will offer a refund or replacement for you. If you have any questions about this product by Porlien, contact us by completing and submitting the form below. If you are looking for a specif part number, please include it with your message.